“Husband killers” is an unpopular nickname given to one of the delicious sweetmeats made in Cambodia. There is an interesting speculation around this particular dish, nom plae ai (or num plae ai), a rice cake, also known as nom somlap pdey, meaning, dessert that kills husbands. According to the Khmer fables, a newlywed wife wanted to surprise her husband with these sweet treats after he returned home from work. These rice cakes were just off the stove and the whole house was filled with delicious fragrance. The delighted husband gobbled everything as soon as he saw them. 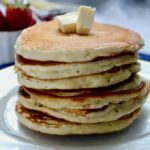 The super hot cakes along with a sticky texture choked his throat and he died. Hence the name – husband killers. 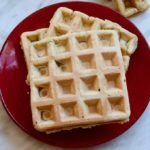 Nom plae ai is an outstanding indulgence that surprises you with each bite. Its soft and rubbery outer layer is complemented with a succulent sweet filling. It’s a treat with a little work for the gums! In the native language of Khmer, nom means cake. 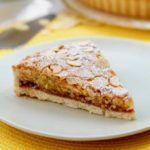 It is also used to refer to pastries and desserts. Nom plae ai are small dumplings made with glutinous rice flour and a juicy palm sugar filling in the center. 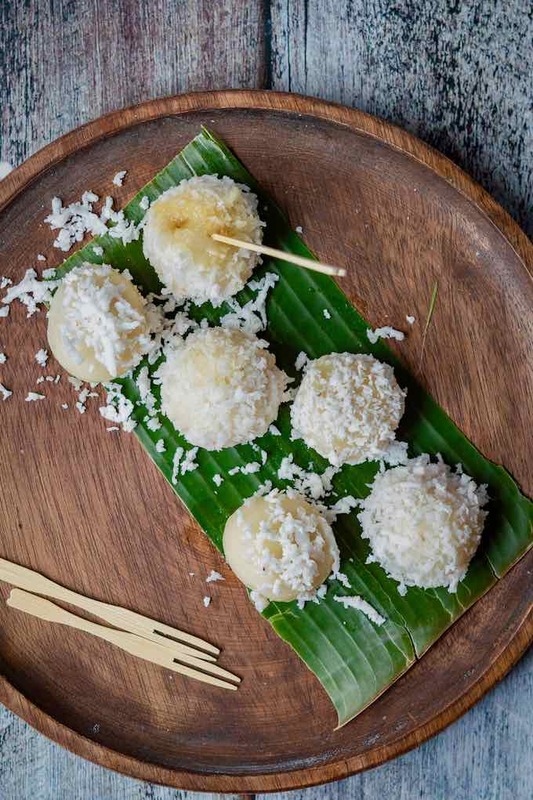 These cooked dumplings are then generously coated in freshly grated coconut scrapings. 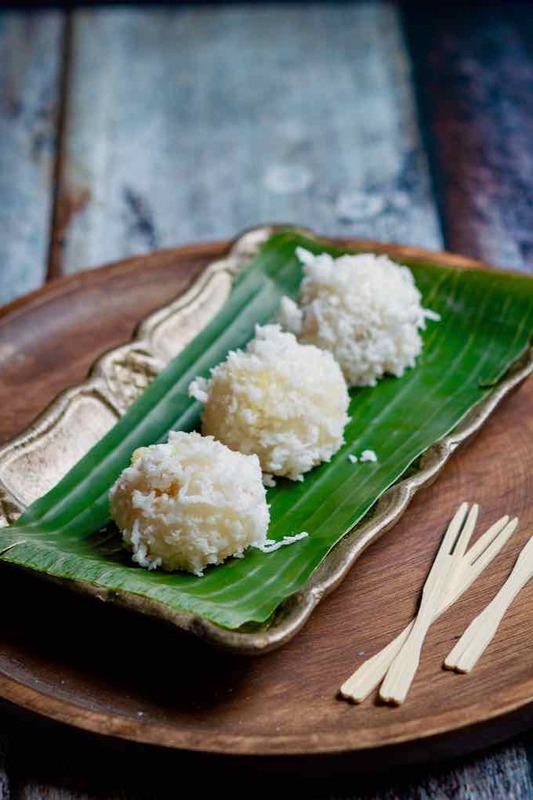 A real coastal dessert with all the classical tropical ingredients – rice flour, coconut and palm sugar! According to the International Rice Research Institute, there are around 2000 indigenous rice varieties grown in Cambodia. Glutinous rice is one of the traditional rice varieties that are native to Cambodia and many South East Asian countries. 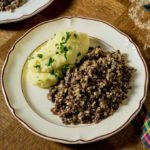 It is a staple in their cuisine. It is commonly known as sticky rice or sweet rice. Unlike the regular rice, it has low amylose content, a starch that helps in keeping the cooked rice grains separate, hence it gets very sticky when cooked. The name glutinous is derived from the latin word glūtinōsus meaning gluey or sticky. 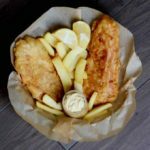 Unfortunately, it is very misleading as many people think it to be related to gluten, which it is not. It is gluten-free as any other rice variety. Glutinous rice flour is the main ingredient in making nom plae ai. 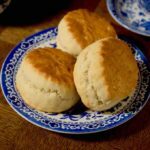 You cannot substitute with the regular rice flour as it completely changes the texture of the sweet. The signature feature of nom plae ai is that it is sticky and chewy to bite, which cannot be achieved with a standard rice flour. Glutinous rice flour is also known as waxy rice flour or even sweet rice flour and can be easily found in any Asian specialty stores under any of these names. The sweetener in this recipe is palm sugar, which is derived from the palmyra trees. It is a common sweetening agent that is extensively used in many Asian countries. Its low melting temperature and high burning temperature makes it an excellent choice for using it in confectionaries. 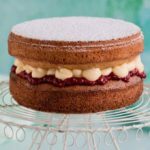 Having a rich flavor and a low glycemic index when compared to regular white sugar, it is gaining popularity quite fast. These cute little sweet dumplings can be served as a dessert or as a snack. The streets of Phnom Penh, the capital of Cambodia, are filled with roadside vendors selling nom plae ai. It is also made in various colors. The outer dough is mixed with a pinch of food coloring to make it more festive and vibrant. The concept of rice cake or rice dumplings is unique to the Asian culture. 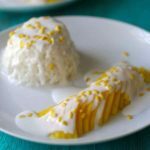 The South East Asian cuisines, especially the Vietnamese, Thai and Chinese cuisine, have hundreds of sticky rice dumplings or cake dishes that are are very similar to the nom plae ai, just like Korean baram tteok, also called daifuku in Japan, or tangyuan in China. 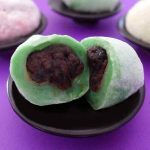 The outer dough is made of sticky rice flour in combination with tapioca starch (in some recipes) with a sweet or savory filling on the inside. 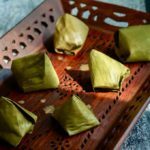 Nom plae ai is also very similar to the Vietnamese floating rice cakes – banh it tran, a savory dumpling filled with pork and shrimp. 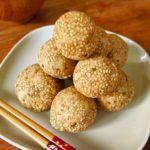 Klepon or onde onde are beautiful green rice balls from Indonesia that are very similar to the Cambodian sweet. The only difference is the color that klepon gets due to the use of pandan leaves. There is also a Japanese sweet dumpling, shiratama dango that is almost the same as num plae aie. Nom plae ai are small dumplings made with glutinous rice flour and a juicy palm sugar filling in the center. 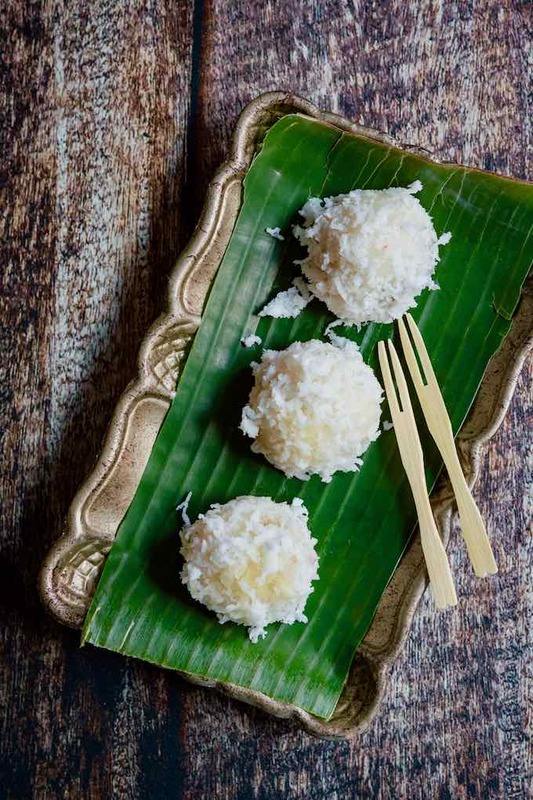 These cooked dumplings are then generously coated in freshly grated coconut scrapings. Place the palm sugar in a saucepan. Add the water. Bring to a boil and cook on medium/low heat until the sugar has melted completely. Discard the excess water if it has not been fully evaporated and mix until smooth and thick enough. Let stand for 3 minutes. Form palm sugar balls of about ½ inch in diameter. Work very quickly as, while cooling, palm sugar becomes more difficult to shape. Place the palm sugar balls on parchment paper and set aside. Pour the sticky rice flour in a large bowl. Add the hot water gradually until a smooth and homogeneous dough is formed. Knead the dough for 3 minutes. Cover the dough with plastic wrap and set aside. Take a small piece of dough and work it into a smooth ball. Then, use the thumbs to flatten the ball and form a small circle, then drop a palm sugar ball in the center. With your fingers, close the circle of dough and then smooth the edges giving it the shape of a ball. Without pressing, gently smooth with a circular motion using both palms and form a ball. Renew the operation until the dough is used up. Place each ball on the parchment paper. In a large pot, boil a large amount of water. Immerse the balls in simmering water over high heat, (taking care not to overload) and cook until they float to the surface. Place in a bowl of cold water for a minute, then take out with a slotted spoon to drain. 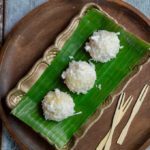 Wear thick, smooth kitchen gloves and roll generously hot glutinous rice balls into the coconut oil and then into the grated coconut. Once you have prepared the dough, you must use it immediately. With time, the dough will become dry and it will be hard to work. Also, it is necessary to have extra rice flour in case the dough is too wet. 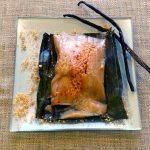 It is also possible to use small pieces of palm sugar instead of cooked and dissolved palm sugar.